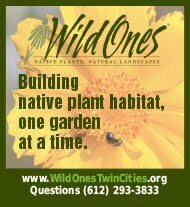 Join us on summer tours of native landscapes in and around the Twin Cities! All three tours are free and open to the public! Purpose: stormwater management, extend roofing membrane lifespan. Plants include 43 species of native plants, including Jacob’s ladder, Cranesbill, Columbine, large leaved aster, partridge pea. Evidence of pollinators and birds: lots of pollinators and other insects observed. 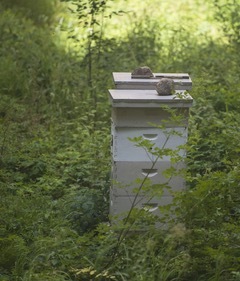 The green roof at the Minneapolis City Hall and Courthouse building is buzzing with honeybees, thanks to a donation from the Shakopee Mdewakanton Sioux Community, which donated the bees from its own apiaries. The project will serve as a demonstration green roof for residents and businesses considering starting their own green roof projects. Sustainable Yard & Home - Come to be inspired! Join native plant and pollinator expert Dave Crawford and homeowner and designer Chris Burda for a walk through a yard landscaped to support native habitat and a home designed for aging in place. 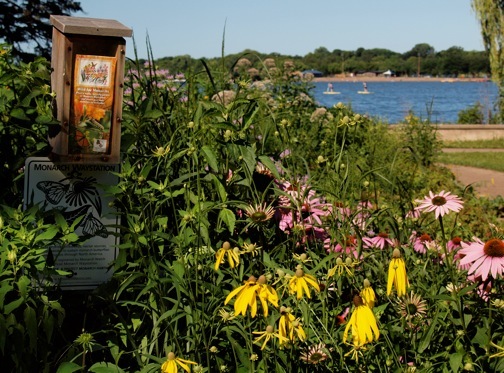 Arrive promptly at 10:30 for an overview of the homeowner’s mission to integrate sustainability and accessibility, followed by informal conversations about the native plants and pollinators and a tour of stormwater management practices at work. Dave Crawford will share his knowledge of the native yard, his holistic philosophy and suggestions for keeping plants and pollinators happy. His stunning photographs of pollinators will fascinate you. Dave and his wife Diane, who are currently building a home that is sustainable and designed for aging in place, will have their architecture and landscape plans on hand for those interested in the process. Chris Burda will offer a tour of water management features designed to keep stormwater on the property in accordance with goals of the City of Minneapolis and with Minnesota GreenStar Certification. She turned to Metro Blooms and to Douglas-Owens Pike for guidance and implementation of a landscape plan that she describes as a project-in-constant-progress. It combines mostly natives with a few treasured non-natives from Mom and Grandma. Her goal to integrate an energy efficient building, sustainable landscape and universal design was not without challenges. She’ll share a few lessons learned and the joys of friendships made along the way. It takes a community. Chris is an exhibit developer and designer serving museums, educational non-profits and community groups, translating ideas into fun and accessible indoor and outdoor experiences. Long time staffer with the Science Museum of Minnesota, she now works independently, currently with the Bakken Museum in Minneapolis and with the Virtual Science Center in San Jose. She helps people change the world, one space at a time. As a Board member with Minnesota Renewable Energy Society she advocates for clean energy as one way to fight climate change. 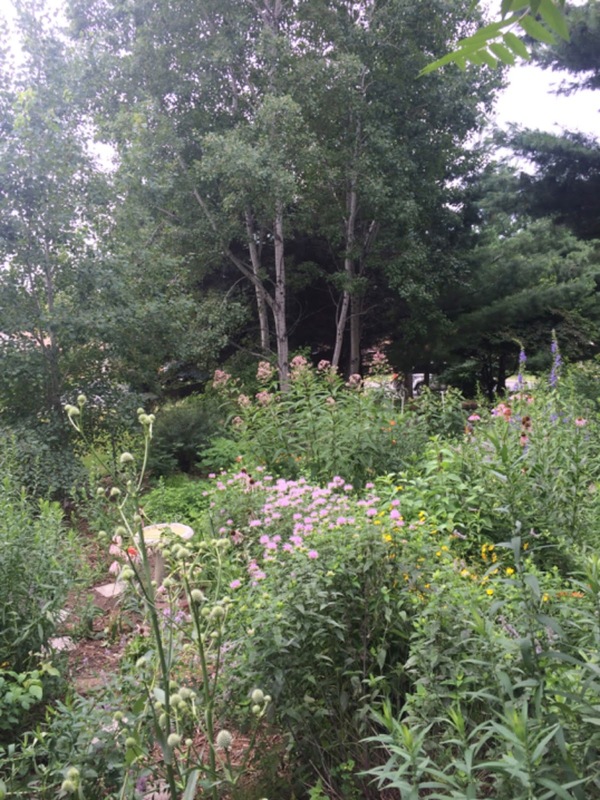 For nearly seven years, this 1/2 acre yard has been slowly transitioned from a conventional to a native landscape. 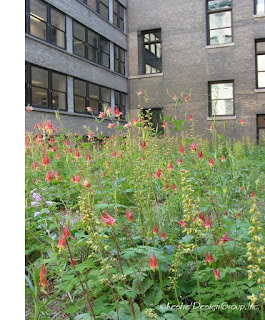 Approximately 75% of the vegetation is now native flowers, grasses, shrubs, and trees. Most lawn has been removed and replaced with vegetation or mulch. 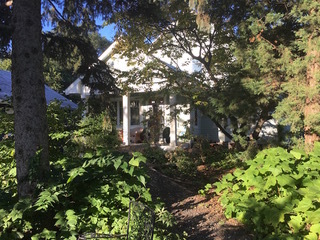 The home is circled by various gardens including two "unmanicured" native gardens, a formally landscaped hillside in the backyard, as well as wooded sideyards. Sprinkled throughout the property is whimsical artwork, water sources for birds, and windchimes. When we began talking nearly a decade ago about plans for an addition to our house, we knew that changes to our back yard would also be needed to make room for the new space. 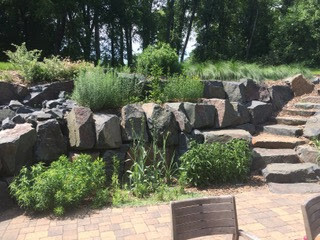 This presented an opportunity to replace our functional, yet unappealing concrete-block retaining wall filled with non-native trees, shrubs, and landscaping stones with something more in keeping with our natural Minnesota landscape. The desire was to create an outdoor space that evoked images of the North Shore and included native grasses and forbs found here in northern Dakota County. When the home addition was finally completed seven years ago we hired a professional landscaping company to install the hardscape for our yard, which includes a rock wall built with large boulders from a quarry in Dresser, WI (i.e. “Dresser trap rock” boulders), a circulating stream that runs through one end of the rock wall, and a brick paver patio between the rock wall and the house. We also took the opportunity to build a small rain garden in one side yard to help retain and filter water from our eaves troughs and sump pump discharge. 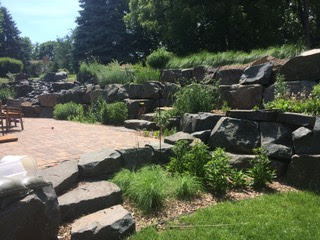 A year after the addition was completed we began work on the design and installation of the native plantings with the help of Tennant Landscaping (located in Hastings, MN). 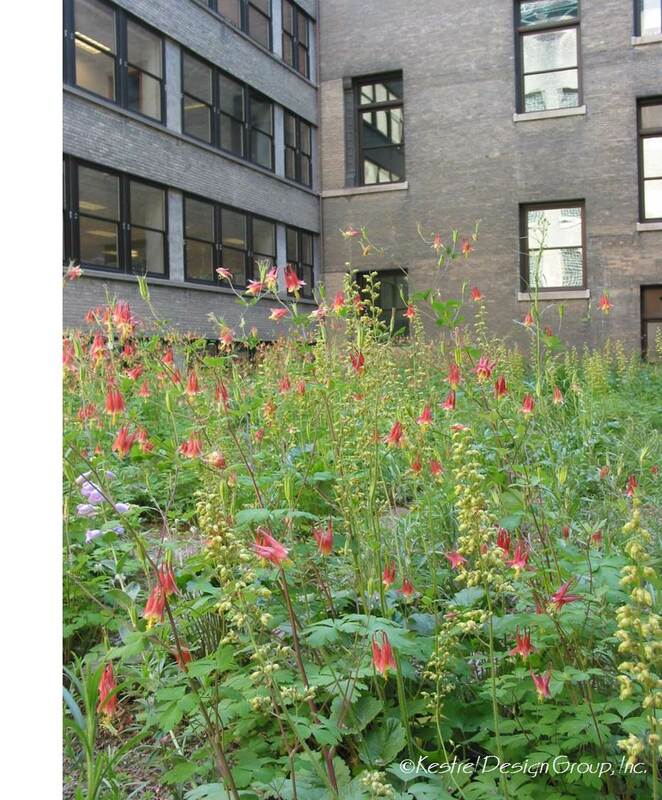 Plants were selected to include a mixture of different sizes, textures, colors and bloom times, as well as to attract a variety of birds, insects, and other native critters. The earliest plants begin blooming soon after the snow disappears (Prairie Smoke), and the last disappear just as the ground begins to freeze (Aromatic Aster and Sky Blue Aster). In between we enjoy a wide variety of flowering plants (Wild Lupine, Swamp and Butterfly Milkweed, Joe Pye Weed, Pale Purple and Purple Coneflower, Prairie Coreopsis, Fireweed, White Wild Indigo, Rattlesnake Master, Rough and Meadow Blazingstar, among others) and grasses (Prairie Dropseed and Little Bluestem). Care of the yard begins each spring with the clearing of the previous year’s dead plants once the first shoots of green begin to appear from the plant bases. (Dead plants are left in place during the fall and winter, both as a source of food and habitat for insects and animals and because they add visual appeal to the wintery landscape.) Now several years post-installation, maintenance mostly includes weeding (a job that recurs throughout the growing season) and annual or biannual application of hardwood mulch. 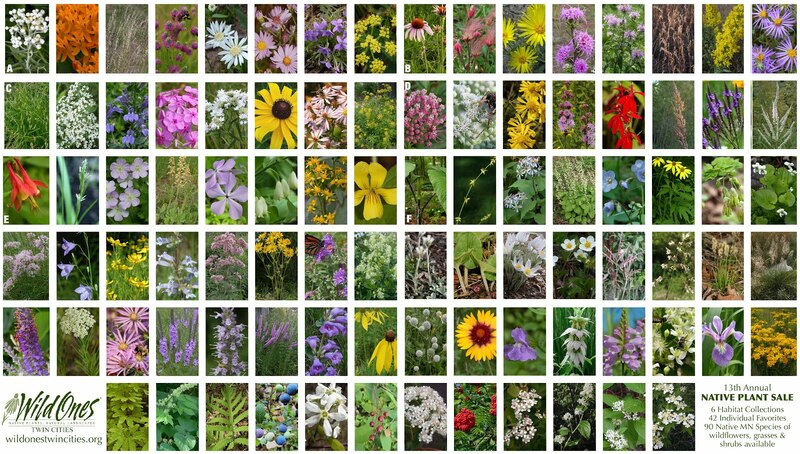 It took about two years for the plants to get fully established, but now that they have matured our two biggest challenges (besides the weeds) are keeping more successful species from dominating others and replacing certain species that have been lost to hungry rabbits (Prairie Phlox, Oxeye, and Prairie Clover have been particularly hard hit). We did install a drip-line irrigation system when the rock wall was installed, but this was only used during the first summer that the plants were installed. It has been a labor of love to create and tinker with the native spaces in our back yard, and our appetite for adding to them grows each year. It has been a source of great fun and learning for our entire family. We hope you’ll enjoy spending time in our native garden as much as we do! The garden is situated on a lot behind the house that starts at the house and slopes toward a small lake. 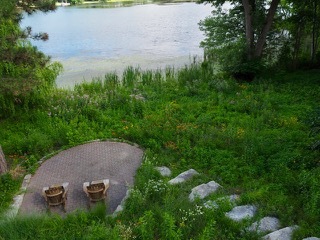 In the summer of 2012, the homeowner decided to convert a conventional garden to a native garden for the health of the lake. She was also tired of the labor involved in maintaining a conventional garden on a slope. 6 years later it is a beautiful, lower maintenance garden with many more beneficial insects and even a few new bird species visitors. 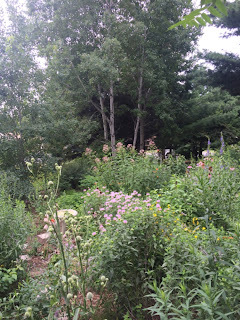 Part of the garden is sunny and part is in shade, so the spring highlights the woodland garden and the sunny, prairie plants shine in the summer. Invasive plants such as buckthorn and reed canary grass have always been a challenge, and in 2017 a new invasive, Japanese Hedge Parsley was found in the sunny areas of the garden. Time spent managing these invasive plants and other garden chores averages about one or two hours/week during the growing season. 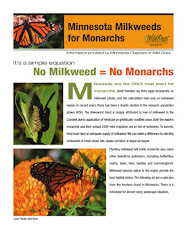 Since 2012 no supplemental water, fertilizer or soil amendments have been needed. Regular group gardening sessions begin in May at 6-8 pm on most Tuesday evenings. The meeting time of group gardening sessions changes in late August to 5-7 pm. Gardening is weather permitting - light rain, some heat or cold is fine but with any extreme, a gardening cancellation notice will be emailed to group day of session. Suggested by WOTC member Leslie Pilgrim. Thank you!